You're ready to buy a home, but you're also looking for a bargain. A foreclosed home seems like the ideal solution: You know that foreclosed properties typically sell for less — sometimes much less — than homes listed and sold on the open market by real estate agents and owners. But what you might not know is that buying a foreclosed property can also prove challenging to anyone who isn't a professional real estate investor. You might not know, either, that some foreclosed homes come with so much damage that the repairs needed to make them livable will quickly eat up any savings on their sales prices. Then there's the matter of actually buying a foreclosure. Depending on how you buy such a property, you might find yourself competing with others who buy, repair, and sell foreclosures for a living. Trying to outbid these pros for your foreclosure is no easy task. To sum up: Buying a foreclosure can be a challenge, one that could cost you plenty of time and money. Here are seven things you absolutely must know if you plan to buy a foreclosed property. It's becoming more difficult to find a foreclosed property today. That's because fewer homeowners are falling into foreclosure. According to RealtyTrac, foreclosures were reported on 1.08 million U.S. properties last year. That's a drop of 3% from 2014, and a huge fall of 62% from 2010. Back in 2010, more than 2.87 million U.S. properties had foreclosure filings against them. There are two main ways to buy a foreclosed home. In the first, lenders auction off homes after the owners of these homes stop paying their mortgages. These properties are then sold at public auctions. The second main way to buy a foreclosure — the way that works better for most buyers who aren't professional real estate investors — is to buy a property after a bank takes ownership of it. These bank-owned properties are listed and sold by real estate agents. You can buy them just as you'd buy a home sold in the more traditional way. Buying a foreclosure at a real estate auction is not easy. First, you'll be trying to outbid professional real estate investors. Even more challenging, you'll need to pay for your foreclosed home with cash. It's not many consumers who have $200,000 or more in cash lying around. If you buy a foreclosure at an auction, you won't have the chance to tour its interiors. This means that you are buying the home sight unseen. You'll have no idea what repair jobs face you after you complete your purchase. The repairs could be extensive, and they could swallow any of the savings you expected to enjoy. Buying a foreclosure owned by the bank is a far easier process. In this type of foreclosure, a bank — which has taken over ownership of a home after its former owners stop making mortgage payments — sells the house, hiring a real estate agent to close the sale. You can buy one of these bank-owned properties by making an offer, just as you would with any other type of home sale. The real estate agent representing the bank will take your offer, present it to the bank, and come back with a counteroffer if the bank doesn't like your original offer. RealtyTrac reported that the average bank-owned home sold for 38% less than comparable homes sold at market-rate figures. This means that buyers can save a significant amount of money buying a foreclosure even if they don't do it at the auction level. Never buy a foreclosed home owned by a bank without first hiring a home inspector to come tour it. Unlike with a foreclosed home bought at auction, you do have the right to a home inspection before closing your sale. Make sure to take advantage of this opportunity. Many foreclosed homes need serious repairs. A home inspector can find these trouble spots. Once you are armed with this information, you can decide whether a particular foreclosure still qualifies as a bargain. 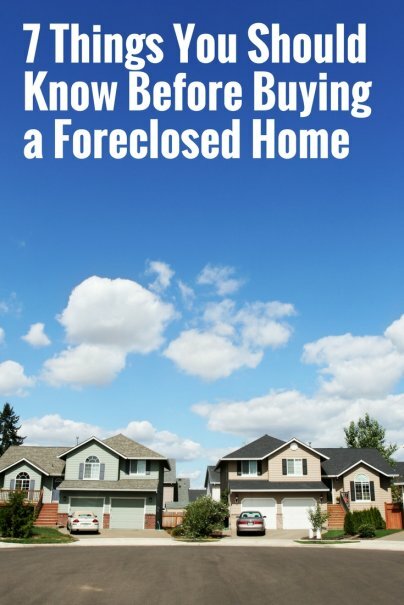 Have you ever bought a foreclosed home? Don't forget HUDHomeStore - yes, you still have to bid, but you do so online and they give owner-occupants the first chances to bid. You can also get FHA financing, including repair escrows for homes that need a little work. You can even see the house in advance! How did you fail to mention this?